Another EPIC conference come and gone, and no, we’re not using “epic” in the way under-10s use it about cool things on the internet. EPIC is the Ethnographic Praxis in Industry Conference, one of the most important annual events for practitioners of anthropology, ethnography and related disciplines. Ethnography is one of Experientia’s key methodologies, underpinning all of the research and design work that we do, and as always, we were in attendance. This year the conference was held in Montreal, and the theme was Perspectives – the different ways in which people see the world. What more fitting topic could there be to discuss video ethnography, and the ways in which we as anthropologists and ethnographers present the perspectives of our research participants? This was one theme that Experientia collaborator Gabriella Piccolo spoke about in a panel on video ethnography. In addition to her ethnographic research and service design skills, Gabriella is a talented videographer and video editor. 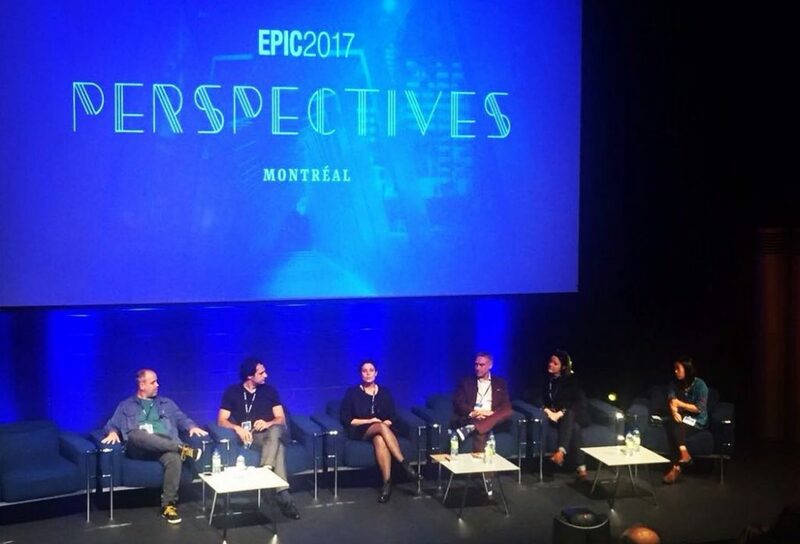 She took part in the inaugural EPIC 2017 Films panel, the first-ever EPIC session to talk about the value of video in ethnographic research. It’s a powerful media, but it’s not easy to manage in terms of costs and post production. Gabriella presented a project that she was instrumental in building as both a video ethnographer and video editor on the Singapore Ageing Gracefully project – a dynamic, interactive, and open-sourced map that contains 24 videos of field research participants, created to share research with stakeholders, including government and healthcare industry representatives. The “Design for Ageing Gracefully” project in Singapore aimed to identify trends, behaviors, and gaps in the elderly healthcare system. The project identified opportunity areas for design-driven innovation in the Singaporean public healthcare space, to facilitate the creation of ideal conditions to support a rapidly ageing society. The interactive map cross-indexes the participant videos (each edited down to the most critical five minutes of insights from the hours of raw data) through the 8 personas that Experientia identified during the ethnographic research and analysis. It offers an innovative means of organizing and accessing a broad archive of rich visual research data. The ethnographic videos and interactive map were important tools when presenting our insights to Singaporean stakeholders such as the ministry of health and hospitals. By positioning the findings very clearly as being directly from the research participants, we were able to reduce institutional resistance to any findings that might have been critical of the system. The videos also allowed people’s unfiltered voices to come through in an engaging way, ensuring their voices were being heard directly when talking about such a sensitive topic as health. Gabriella presented a video of the interactive map being used, showing how the map could be navigated by research participant, persona, or locations in Singapore, allowing people to explore the research insights and then directly watch short videos of each participant, edited from the contextual interviews conducted in Singapore. Our video was praised for the way it goes beyond video, to become a tool in a client’s hands, able to communicate the participants’ voice with no voice over. This video presents a novel approach to sharing a database of respondent videos of ageing Singaporeans across the city. The featured interface presents an engaging and expansive open-source approach to sharing information that could be used by a variety of stakeholders. It stands as a nice counterpoint to the compressed presentation time frames, assumptions of limited boardroom attention spans, and assertion of proprietary insights that are so often a part of the corporate ethnography world. Although expansive by design, this video database also remains manageable by having a simple interactive map and by compressing the insights gained from 24 respondents into 8 different personas. The video itself serves as a demonstration of the interactive tool in action and it clearly outlines the possibilities of this open-source resource, which has already been used across a range of stakeholders and participatory design settings. It does a good job of cutting between the demonstration of the tool and clips taken from the video database itself. The empathetic perspective of the filmmakers is clear, the video production levels are strong, and the use of in-context footage, which is always valued, is perhaps even more important in the case of healthcare. Video ethnography, when done well, is both time consuming and costly. However, as the interactive map demonstrates, it can be worth the costs – to be able to clearly communicate research insights to a wide variety of stakeholders and ensure that when it comes to perspectives, the voice of the research participants comes through loud and clear.